Ferrari junior Robert Shwartzman grabbed the second pole position of his Formula 3 European Championship career with a last-ditch effort at the Nurburgring. The Prema Powerteam-run St Petersburg teenager was third as the chequered flag fell, but his final lap enabled Shwartzman to steal the top spot away from team-mate Mick Schumacher by a mere 0.047 seconds. The pole fight boiled down to a battle between this duo and championship leader Dan Ticktum, and it was Motopark's Red Bull junior at the top of the times as the session moved into its closing stages. But first Schumacher managed to beat Ticktum's time, and then he in turn was pipped by Shwartzman at the last gasp. Enaam Ahmed continued his strong season by taking fourth in his Hitech GP car to complete an all-British second row. 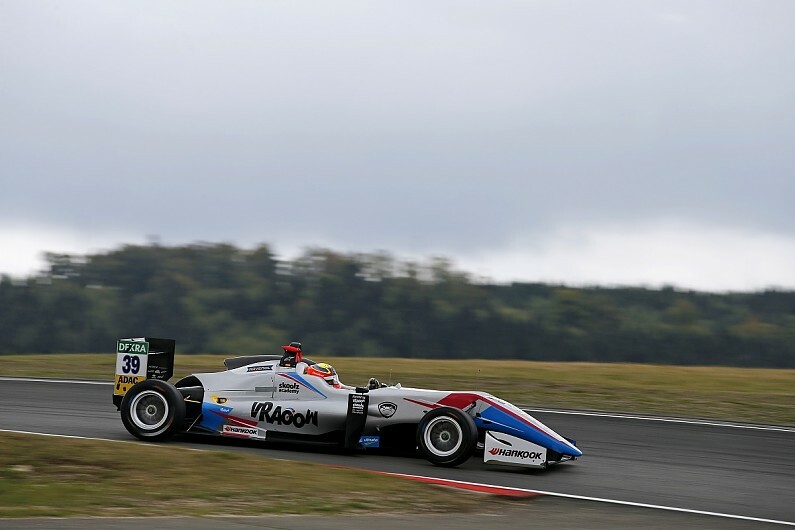 The third rank is all-Estonian, with Prema's Ralf Aron heading Motopark's recent form man Juri Vips, who sits right behind Ticktum in the championship standings. Alex Palou took seventh for Hitech, while Marcus Armstrong, the leading Prema driver in the title chase, had a miserable day. First the New Zealand Ferrari protege missed much of free practice with a mechanical problem, and then it was discovered that he required a change of his Mercedes engine, thereby incurring a 10-place grid penalty for Saturday's race. A last-lap effort moved Armstrong up to eighth on the grid, but his grid penalty will dump him to near the back of the 22-car field. Jehan Daruvala was the top representative from Carlin, and moves up to inherit Armstrong's eighth place, ahead of Motopark's Marino Sato. Rounding out the top 10 on the grid is Guan Yu Zhou - normally a contender for pole, the third of the Prema/Ferrari prospects only improved on the final lap to move himself up to the fifth row.